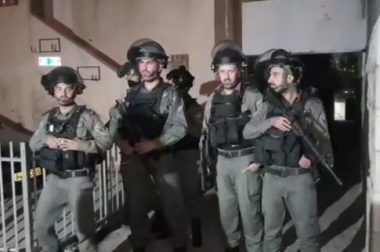 Dozens of Israeli soldiers and police officers attacked, on Thursday evening, dozens of Palestinians participating in a seminar at Silwan Club in Ras al-‘Amoud neighborhood, in occupied East Jerusalem, before abducting Jerusalem Governor, and three young men. The Wadi Hilweh Information Center in Silwan (Silwanic) has reported that the army, police officers and intelligence officers surrounded the Silwan Club after closing the streets leading to it, before invading the club while the Palestinians were holding a seminar organized by Palestinian Vision Organization, and ACT Center for Alternative Dispute Resolutions and Studies. Silwanic added that the soldiers, including officers in plain clothes, assaulted the participants and speakers, including Jerusalem Governor Adnan Gheith, his assistance Mohannad Salhab, in addition to Abed Barbar and the director of Palestinian Vision Organization Rami Nasser-Eddin. The officers then abducted the governor, and three young men, before moving them to an unknown destination. The Palestinian Red Crescent Society said its medics rushed to the center, and provided treatment to many Palestinians who suffered various cuts and bruises.